Dada or Dadaism is a cultural movement that began in neutral Zürich, Switzerland, during World War I and peaked from 1916 to 1920. The movement primarily involved visual arts, literature (poetry, art manifestoes, art theory), theater, and graphic design, which concentrated its anti war politic through a rejection of the prevailing standards in art through anti-art cultural works. Like Surrealism and many other modern art movements, Dadaism reflected the collapse of the cherished ideals of Western society. In the wake of the Industrial revolution, the "death of God," and the breakdown of pre-modern traditional society, the old verities no longer provided a stable basis for society. This had given rise to Modernism, and the rise of Progressivism, which held that society was evolving toward ever more perfect forms. This view was smashed by the catastrophe of the First World War. Dada represented a rebellion against that failure and all the established verities. Dada activities included public gatherings, demonstrations, and publication of art/literary journals. Passionate coverage of art, politics, and culture filled their publications. The movement was a protest against the barbarism of World War I, the bourgeois interests that Dada adherents believed inspired the war, and what they believed was an oppressive intellectual rigidity in both art and everyday society. The movement influenced later styles, movements, and groups including surrealism, Pop Art and Fluxus. Dada was an international movement, and it is difficult to classify artists as being from any one particular country, as they were constantly moving from one place to another. According to its proponents, Dada was not art — it was "anti-art." Dada sought to fight art with art. For everything that art stood for, Dada was to represent the opposite. Where art was concerned with aesthetics, Dada ignored aesthetics. If art were to have at least an implicit or latent message, Dada strove to have no meaning — interpretation of Dada is dependent entirely on the viewer. If art is to appeal to sensibilities, Dada is to offend. It is perhaps then ironic that Dada became an influential movement in modern art. Dada became a commentary on order and the carnage they believed it wreaked. Through this rejection of traditional culture and aesthetics the artists associated with the movement hoped to destroy traditional culture and aesthetics. According to Tristan Tzara, "God and my toothbrush are Dada, and New Yorkers can be Dada too, if they are not already." A reviewer from the American Art News stated that "The Dada philosophy is the sickest, most paralyzing and most destructive thing that has ever originated from the brain of man." Art historians have described Dada as originating, in large part, "in reaction to what many of these artists saw as nothing more than an insane spectacle of collective homicide." Years later, Dada artists described the movement as "a phenomenon bursting forth in the midst of the postwar economic and moral crisis, a savior, a monster, which would lay waste to everything in its path. [It was] a systematic work of destruction and demoralization… In the end it became nothing but an act of sacrilege." According to Dada, reason and logic had led people into the horrors of war; the only route to salvation was to reject logic and embrace anarchy and the irrational. However, this could also be thought of as the logical side of anarchy and rejection of values and order. It is not irrational to embrace the systematic destruction of values, if one thinks them to be flawed. In 1916, Hugo Ball, Emmy Hennings, Tristan Tzara, Hans Arp, Richard Huelsenbeck, Sophie Täuber, along with others discussed art and put on performances in the Cabaret Voltaire (Zürich) expressing their disgust with the war and the interests that inspired it. By some accounts Dada coalesced on October 6 at the cabaret. At the first public soiree at the cabaret on July 14, 1916, Ball recited the first manifesto (see text). Tzara, in 1918, wrote a Dada manifesto considered one of the most important of the Dada writings. Other manifestos followed. We had lost confidence in our culture. Everything had to be demolished. We would begin again after the "tabula rasa." At the Cabaret Voltaire we began by shocking common sense, public opinion, education, institutions, museums, good taste, in short, the whole prevailing order. A single issue of Cabaret Voltaire was the first publication to come out of the movement. When World War I ended in 1918, most of the Zürich Dadaists returned to their home countries, and some began Dada activities in other cities. The origin of the name Dada is unclear; some believe that it is a nonsensical word. Others maintain that it originates from the Romanian artists Tristan Tzara and Marcel Janco's usage of the Romanian word for yes, which is often repeated several times for effect, thus resulting in da, da, meaning yes, yes. (Engl. equivalent: yeah, yeah as in speaking with sarcasm to say: yeah, right). Others believe that a group of artists assembled in Zürich in 1916, wanting a name for their new movement, chose it at random by stabbing a French-German dictionary with a paper knife, and picking the name that the point landed upon. Dada in French is a child's word for hobby-horse. In French the colloquialism, c'est mon dada, means it's my favorite, or it's my hobby. It has also been suggested that the word "dada" was chosen randomly from the Larousse dictionary. According to the Dada ideal, the movement would not be called Dadaism, much less designated an art-movement. 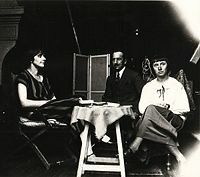 Picture of Nelly van Doesburg (left), Piet Mondrian and Hannah Höch in Paris, 1924, photographer unknown. The groups in Germany were not as strongly anti-art as other groups. Their activity and art was more political and social, with corrosive manifestos and propaganda, biting satire, large public demonstrations and overt political activities. It has been suggested that this is at least partially due to Berlin's proximity to the front, and that for an opposite effect, New York's geographic distance from the war spawned its more theoretically-driven, less political nature. In February 1918, Richard Huelsenbeck gave his first Dada speech in Berlin, and produced a Dada manifesto later in the year. 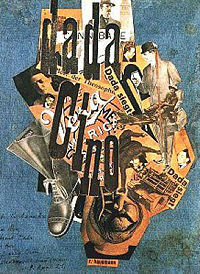 Hannah Höch and George Grosz used Dada to express post-World War I communist sympathies. Grosz, together with John Heartfield, developed the technique of photomontage during this period. The artists published a series of short-lived political journals, and held the International Dada Fair in 1920. The Berlin group saw much in-fighting; Kurt Schwitters and others were excluded from the group. Schwitters moved to Hanover where he developed his individual type of Dada, which he dubbed Merz. The Berlin group published periodicals such as Club Dada, Der Dada, Everyman His Own Football (Jedermann sein eigner Fussball), and Dada Almanach. In Cologne (Köln), Max Ernst, Johannes Theodor Baargeld and Arp launched a controversial Dada exhibition in 1920 which focused on nonsense and anti-bourgeois sentiments. Like Zürich, New York was a refuge for writers and artists from World War I. Soon after arriving from France, Marcel Duchamp and Francis Picabia met American artist Man Ray after arriving only days apart in June of 1915. By 1916 the three of them became the center of radical anti-art activities in the United States. American Beatrice Wood, who had been studying in France, soon joined them. Much of their activity centered in Alfred Stieglitz's gallery, 291, and the studio of Walter and Louise Arensberg. The New Yorkers did not label themselves Dada, nor did they issue manifestos or organize riotous events. However, they issued challenges to art and culture through publications such as The Blind Man, Rongwrong, and New York Dada in which they criticized the traditionalist basis for museum art. New York Dada lacked the disillusionment of European Dada and was instead driven by a sense of irony and humor. During this time Duchamp began exhibiting readymades (found objects) such as a bottle rack, and got involved with the Society of Independent Artists. In 1917 he submitted his famous Fountain, a urinal signed R. Mutt, to the Society of Independent Artists show—only to have the piece rejected. First an object of scorn within the arts community, it has since been canonized, ironically, and is often considered a watershed work of modern art. The committee presiding over Britain's prestigious Turner Prize in 2004, for example, called it "the most influential work of modern art." 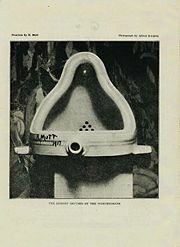 "Duchamp's urinal tops art survey"
By 1921, most of the original dada artists moved to Paris where Dada experienced its last major incarnation (see Neo-Dada for later activity). 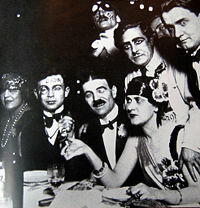 The French avant-garde kept abreast of Dada activities in Zürich with regular communications from Tristan Tzara (whose pseudonym means "sad in country," a name chosen to protest the treatment of Jews in his native Romania), who exchanged letters, poems, and magazines with Guillaume Apollinaire, André Breton, Max Jacob, and other French writers, critics and artists. The first introduction of Dada artwork to the Parisian public was at the Salon des Indépendants in 1921. 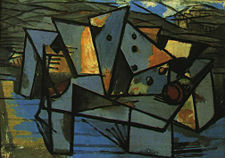 Jean Crotti exhibited works associated with Dada including a work entitled, Explicatif bearing the word Tabu. In The Netherlands the Dada movement centered mainly around Theo van Doesburg, most well-known for establishing the De Stijl movement and magazine of the same name. Van Doesburg mainly focused on poetry, and included poems from many well-known Dada writers in De Stijl such as Hugo Ball, Hans Arp and Kurt Schwitters. Van Doesburg became a friend of Schwitters, and together they organized the so-called Dutch Dada campaign in 1923, where Van Doesburg promoted a leaflet about Dada (entitled What is Dada? ); Schwitters read his poems; Vilmos Huszàr demonstrated a mechanical dancing doll; and Van Doesburg's wife, Nelly, played avant-garde compositions on piano. Van Doesburg wrote Dada poetry himself in De Stijl, although under a pseudonym, I.K. Bonset, which was only revealed after his tragic death in 1931. 'Together' with I.K. Bonset, he also published a short-lived Dutch Dada magazine called Mécano. Dada was not confined to the visual and literary arts; its influence reached into sound and music. Kurt Schwitters developed what he called sound poems and composers such as Erwin Schulhoff, Hans Heusser and Albert Savinio wrote Dada music, while members of Les Six collaborated with members of the Dada movement and had their works performed at Dada gatherings. While broad, the movement was unstable. By 1924, Dada was melding into Surrealism, and artists had gone on to other ideas and movements, including socialist realism and other forms of modernism. Dada was influential for various anti-art and political and cultural movements including Situationists. At the same time that the Zürich Dadaists made noise and spectacle at the Cabaret Voltaire, Vladimir Lenin wrote his revolutionary plans for Russia in a nearby apartment. He was unappreciative of the artistic revolutionary activity near him. Tom Stoppard used this coincidence as a premise for his play Travesties (1974), which includes Tzara, Lenin, and James Joyce as characters. The Cabaret Voltaire fell into disrepair until it was occupied by a group claiming to be neo-Dadaists, led by Mark Divo, from January to March of 2002. Many of their activities received as much public attention as the original Dada movement. The group included Jan Thieler, Ingo Giezendanner, Aiana Calugar, Lennie Lee and Dan Jones. After their eviction the space became a museum dedicated to the history of Dada. The work of Lennie Lee and Dan Jones remained on the walls of the museum. Several notable retrospectives have examined the influence of Dada upon art and society. In 1967, a large Dada retrospective was held in Paris, France. In 2006, the Museum of Modern Art in New York City held a Dada exhibition in collaboration with the National Gallery of Art in Washington, D.C. and the Centre Pompidou in Paris. 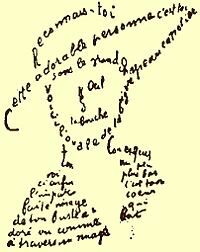 For a more complete list of Dadaists, see List of Dadaists. The word dada means grandfather in hindi/urdu. Expressionism is seen as having its beginnings in Dada. Futurism positivistic predecessor to Dada. ↑ Fred S. Kleiner and Christin J. Mamiya. Gardner's Art Through the Ages, 12th edition, Wadsworth Publishing, 2005. Sandqvist, Tom (2006). Dada East: The Romanians of Cabaret Voltaire. The MIT Press. ISBN 978-0-262-19507-2. Dada art (Dada Online) includes images showing the characteristics of Dada. This page was last modified on 18 November 2017, at 22:54.